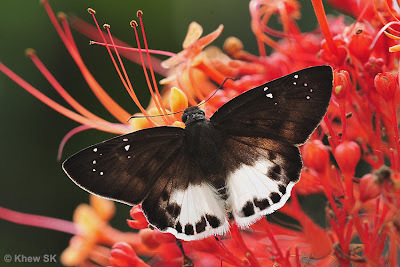 The Ultra Snow Flat (Tagiades ultra) is a relatively uncommon "flat" of the sub-family Pyrginae. It has a wingspan of about 38-45mm. Like most of the other species in the genus Tagiades, the Ultra Snow Flat is often observed sunbathing with its wings opened flat on the top surfaces of leaves. It is essentially a forest-dependent butterfly and is rarely seen outside the nature reserves. This pristine individual was photographed feeding on the flowers of the Pagoda Flower (Cleredendron sp). It was flitting rapidly from flower to flower, feeding with its wings opened flat. This shot captured some of the backlighting as it was on a tall bush with the forest canopy and the sky in the background.